The maple classical guitars are stunning to look at and sound as good as they look. They have an incredible tonal range not found in many maple classical guitars. These maple guitars have crystal clear trebles and deep, rich basses. 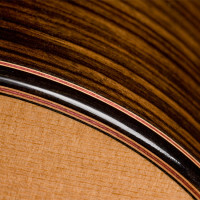 The basses are as rich sounding as those found on a typical Indian rosewood classical guitar. 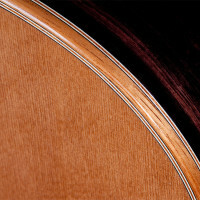 This is rare for a maple classical guitar. John considers the maple classical guitar to be his specialty. Only the finest European maple is used. The maple typically has a quilted grain pattern that makes it sparkle. Maple classical guitars come with Engelmann spruce tops only. Engelmann spruce both sound and look best with the maple back and side. The bindings and bridge are chechen. This golden brown hardwood is an excellent complement to the maple. The details give these guitars a rich and harmonious look. Get information on instructional content, videos, drawings, new products, specials and available guitars in the newsletter. how annoying it can become receiving newsletters often.